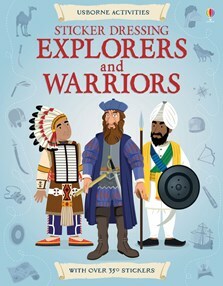 Young readers can kit out famous explorers and fierce warriors in this fantastic sticker book full of authentic detail. Includes over 350 stickers to kit out the explorers from different ages, and warriors including Celtic raiders, samurai, royal musketeers and mongol warlords. With fascinating historical facts about great explorers such as Marco Polo and astronaut Neil Armstrong. This book contains the following titles: Sticker Dressing Explorers and Sticker Dressing Warriors.